On the element of your choice and the agency of that element. This paper analyses the natural element water and its purification and curative function, in the context of Christianity and bathing activity, in early medieval Italy, approximately between the fifth and the seventh centuries. The paper starts by tracing the qualities of water as an element in nature, and how the Italian society responded and produced social and cultural value. The next section examines water as a spiritual purifier in Christianity, with reference of works of medieval art. Lastly, the curative function of water is analyzed with the study of bathing activity in medieval Italy. In this section, the development of bathing from the Roman world to medieval Italy is also analyzed with the continuity of the discussion of Christianity and how it affected the people’s preference in bathing as well as their perception of water. Among the four classical elements, water was regarded as the ylem, or basic substance of the universe. Water is pervasively and powerfully presented within Western philosophical, literary, and geographical thought. Thales, who is widely regarded as the first Greek philosopher, claimed that water is the source of all things. Reasoned from the circumstance that moisture appears to nurture and inhabit all living things, Thales claimed that such wetness is contained in seeds and sperm, making water as the progenitor-agents of much life. Such philosophical explanation can be supported by the nature of water. Not only it is obvious that the survival and growth of plants, animals, and people largely depends on water; the fact that babies are nurtured inside and protected by amniotic fluid before birth, suggests how particularly close and harmonious the relationship of the people and water is. The way how water was integrated into daily life and contributed to the civilization in early medieval society is particularly irreplaceable when compared to the other three elements – fire, earth and air. Domestic usage of water, bathing, irrigation and drainage, fishing, milling and transport all receive full benefit from water. The social and economic values of water can be showed by the scenes of the cities developed upon good sources of water, the numerous sanctuaries built near springs and rivers, and the gathering of women and men at fountains and wells. Water, as an essential element for any community, was not only a resource upon which people relied heavily, but also an element which largely produced philosophical and cultural reactions, which ultimately the Etymologies written by Isidore of Seville in the early seventh century was one of these. Isidore of Seville remarked that water is “wondrous” by its numerous unusual natural properties – curing or sickening people, making plants grow, washing dirt off, quenching thirst, and even removing sins. The natural element water imbued imaginations, associations and cultural values which step forward from its initial nature and practical function. Largely due to the natural function of cleansing and nurturing of water, people associate water with the power of healing and purification. For example, the health of a human body depends on medieval humors, which is the balance of water and the other three elements. Baths, spas, and hot springs were popular not only for the purpose of hygiene and relaxation, but also due to their belief in the benefit of bathing to their physical and spiritual health. The purifying and curative power of water as well as bath was certainly strengthened by the religious association of Christianity. Water, as a friendly, useful and tangible element in the Middle Ages, is easily associated with positive qualities in most religions, including Christianity, which water is considered as a purifier. The importance of water in Christianity is interestingly expressed by the fact that “water” is mentioned in the Bible 442 times in the New International Version and 363 times in the King James Version. One of the most important rite in the Church is baptism, which by the immersion of a person in water, one receive gift of the Holy Spirt and one’s sins is simply washed away. The initiates “died” and were reborn in Christ in baptism. This is when the element water is greatly associated with purification as well as the religious sense of death and rebirth, which is expressed in works of Medieval art, which can be viewed as Christian art in the early Middle Ages. 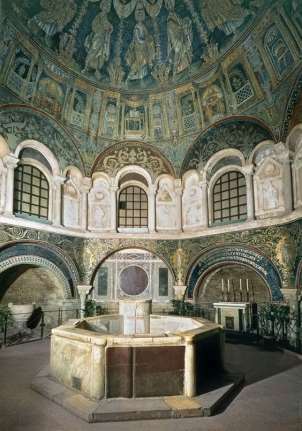 Analyzing a baptistery in real life, the Baptistery of the Orthodox in Ravenna in Italy built in the middle of the fifth century (see Fig.1), the function of purification associated with Christianity cannot be more obvious. The sacrament of baptism, we recall, symbolized not only the cleansing of the soul but also the death of the sinful self and the initiate’s rebirth in Christ. The architectural design of an octagon plan associates with the spiritual resurrection of baptism, as for the context of Early Christian numerology, eight was the number of regeneration – “on the eighth day after creation the world began; and Jesus arose from the dead on the eighth day of the Passion Cycle”. At the center of the octagonal building is the baptismal font used for immersion, which is built like a bath. In such a Christian setting, the water poured inside the baptismal font is sublimated as a wondrous spiritual purifier, demonstrating how much cultural value a natural element water can imbued. The illustrations on the walls and dome of the Baptistery of Orthodox is stressing the importance of baptism as the first step in the divine scheme of salvation. 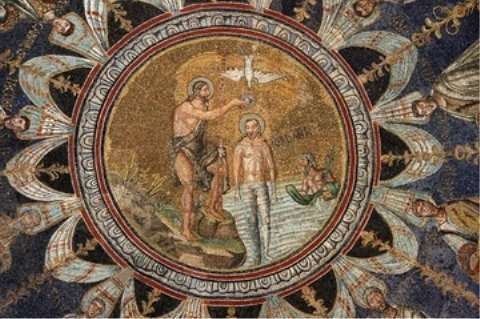 The center of the dome depicts the doctrine that Saint John the Baptist is baptizing Christ with water from the Jordan River (see Fig.2). This evokes a sense that the purest form of water which is able to cure and purify one’s soul can lie in natural environment like a river, and is not limited to a holy Christian architecture or a luxurious bath. Interestingly the small human figure on the right hand side is a river god who personifies the Jordon River, showing the rich imagination and association with water by the Italians of the early Middle Ages (see Fig.2). Another example is an apse mosaic located not in Italy, but in Thessalonika in Greece, which has a similar background with Ravenna, that both are a former Roman imperial city that became an important Christian capital in the Middle Ages. Despite its location not in Italy, this apse mosaic in a small chapel dated in the early sixth century is worth analyzing as it clearly illustrates the holy quality of the element water in the context of Christianity, which the Christianity in Greece and Italy would not differ much in the early Middle Ages. It depicts the incarnation of Christ – “the Lord, represented in human form, emanates from a radiant glory” (see Fig.3). Below at Crist’s feet, four rivers of paradise stream down from a hilltop. Ancient tradition held that four sacred rivers symbolized the four Gospels that flow from Christ. An inscription at the bottom of the mosaic explains that Jesus is the “spring of living water”, clearly evokes association that water would have the holy power like Christ, including curing and purifying. Water is also somehow associated with paradise, which would be the home of Christ and those who had received baptism. Fig.1 Baptistery of the Orthodox, mid-5th century. Stucco sculpture. Ravenna, Italy. Fig.2 Baptism of Christ, dome of the Baptistery of the Orthodox, mid-5th century. Mosaic. Ravenna, Italy. 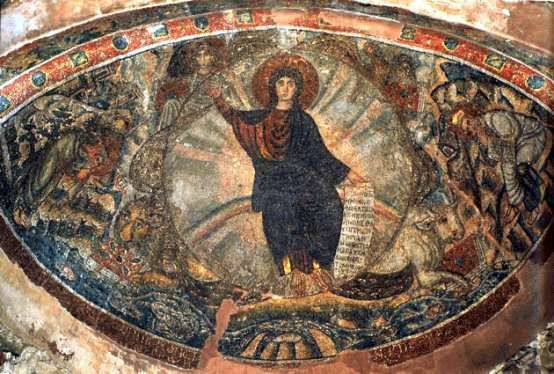 Fig.3 Christ in Glory, the Vision of Ezekiel, Hosios David, early 6th century. Apse mosaic. Thessalonika, Greece. Noted that bathing is not a new habit but a custom that survived in medieval Italy after the Rome’s demise. Therefore, the custom of bathing in the Roman world is briefly explained as follows. To the Romans, bathing was an irreplaceable part of the daily routine, which created relaxation, happiness, comfort, and well-being after a morning of hard work and business. Bathing is viewed as a necessity as well as luxury, as baths are built with lavish and magnificent interiors, decorated with trophies, inscriptions, and sculpture, which reflected the splendor of the empire and the prosperity. Furthermore, bathing had already gone beyond the functional and hygienic necessities of washing, and had been considered to be able to cleanse physical as well as moral stains. Romans usually exercise before bathing as a means of keeping fit and healthy. The feelings of regeneration and rebirth of the body achieved through exercise and bathing acted as an effective tonic for the mind. Hence, bathing, from its earliest history, was considered as therapeutic measure and received full support and authority from ancient medicine. Continuing to the Middle Ages of Italy, the habits of bathing was continuously popular. The understanding of bathing as the means of cleansing and hygiene as well as the maintenance or reestablishment of health was apparent. The development is that there was a change in the preference of where and what kind of water to bath. In the Roman world, people prefer bathing in the communal baths that is luxuriously decorated. However, in medieval Italy, with reference to the previous section “Christianity and Purification of Water”, people tend to define water of purity as from a natural environment, hence they prefer to enjoy therapeutic thermo-mineral baths, that is built at or near natural hot springs, than the artificially heated baths in a luxurious setting. The popularity of thermo-mineral baths in the Middle Ages depends on the curative qualities of their waters. in relation to the balance of elements in the setting – all four elements of water, earth, fire, and air tangibly present in a thermos-mineral bath which might help the bodies to achieve a balance between the four medieval humors and hence to achieve health. The nature of the thermal-mineral phenomena of the region and the technical and architectural setups built around them on the volcanic hills were described with great precision by Dio in the early third century: “The mountains here, which lie close to the inner bodies of water, have springs which send forth a great deal of fire mingled with water â€¦ from this association the water is heated and the fire moistened. The water on its way down the foothills to the sea runs into reservoirs and the inhabitants conduct the steam from it through pipes into upper rooms where they use the steam for vapor baths; for the higher it ascends from the earth and from the water, the drier it becomes. Costly apparatus is in use for turning both the vapor and water into practical use, and they are very serviceable indeed for the uses of daily life and also for effecting cures”. Here we can observe the presence of all classical elements in the setting of a thermo-mineral bath – the natural heat of spring is “fire mingled with water”; the element earth presents as the water passes through “the foothills” while thermo-mineral baths were built in comparatively rural environment which are rocky and muddy, and some baths even were built directly on top of the Roman ruins; lastly, “steam” is created, which is a wet and visible form of the element air. Besides, it is also believed the mineral content added to water would produce different curative functions for different illnesses. Concerning the curative effect of mineral water, one could referred to the ancient book written by Vitruvius, a famous Roman author and architect, of the first century BC. Vitruvius devoted an entire chapter in Book Eight to the properties of waters in the ancient world: “every hot spring has healing properties because it has been boiled with foreign substances, and this acquires a new useful quality. For example, Sulphur springs cure pains in the sinews, by warming up and burning out the corrupt humors of the body by their heat. Aluminous springs, used in the treatment of the limbs when enfeebled by paralysis or the stroke of any such malady, introduce warmth through the open pores, counteracting the chill by the opposite effect of their heat, and thus equably restoring the limbs to their former condition.”. Rounding up the qualities of water as a beneficial natural resource contributing to the civilization of the society, a holy spiritual purifier in the Christian context, and an agency that combines with different elements and substances to generate curative function; water seems to be a perfect and completely positive element in the eyes of the medieval Italian society. However, bathing, as an activity which one’s body is soaked and surrounded by water faced opposition of the Christian Church interestingly starting from the fifth century. As mentioned, bathing was a luxurious activity in the Roman world, which the Church drew a connection between the devil and the sinful temptations of baths, was against the Christian notion of spirituality. Barsanuphius, a hermit from Palestine, was asked if it was a sin to bathe if it were ordered by one’s doctor, then the Church responded: “Bathing is not absolutely forbidden to one who needs it – of you are ill, you need it; so, it is not a sin. If a man is healthy, it cossets and relaxes the body and conduces to lust”. This query illustrates the permissive position taken by the Church with respect to medicinal and curative bathing. Many thermo-mineral baths and other bathing facilities continued to function throughout the Middle Ages. Since medieval medicine depended as much as ancient medicine has done upon hydrotherapy as a preventive and curative measure. The opposition of the Church to bathing in medieval Italy is not an opposition to water. The Church respected the curative function of water, and reduced bathing to a functional, hygienic, and medicinal activity, opposing the component of pleasure and luxury associated with the experience of bathing. This reflected the seriousness of the medieval Italian society in their rational and intellectual reflection of their compact and spiritual relations with natural elements like water. David Macauley, Elemental philosophy: earth, air, fire, and water as environmental ideas (Albany: State University of New York Press, 2010). By Wikipedians, Biochemistry: An Introduction (PediaPress GmbH, Mainz, 2011), p.62. David Macauley, Elemental philosophy: earth, air, fire, and water as environmental ideas (Albany: State University of New York Press, 2010), p.43. Cynthia Kosso and Anne Scott, The Nature and Function of Water, Baths, Bathing and Hygiene from Antiquity through the Renaissance (Brill), p.2. Paolo Squatriti, Water and society in early medieval Italy, AD 400-1000 (Cambridge: Cambridge University Press, 1998), p.8-9. Marilyn Stokstad, Medieval Art (Colorado: Westview Press, 2004), p.5. Douglas Biow, The Culture of Cleanliness in Renaissance Italy (London: Cornell University Press, 2006), p.4. Fikret Yegül, Baths and Bathing in Classical Antiquity (New York: Architectural History Foundation, 1995), p.5. Barsanuphius, 336 (ed. S. N. Schoinas, Volos, 1960); A.H.M. Jones, LRE, II, 977; III, 328. "Symbolism and Use of Water in Religion." UKEssays.com. 11 2018. All Answers Ltd. 04 2019 <https://www.ukessays.com/essays/religion/symbolism-water-religion-4873.php?vref=1>. "Symbolism and Use of Water in Religion." All Answers Ltd. ukessays.com, November 2018. Web. 20 April 2019. <https://www.ukessays.com/essays/religion/symbolism-water-religion-4873.php?vref=1>. UKEssays. November 2018. Symbolism and Use of Water in Religion. [online]. Available from: https://www.ukessays.com/essays/religion/symbolism-water-religion-4873.php?vref=1 [Accessed 20 April 2019]. UKEssays. Symbolism and Use of Water in Religion [Internet]. November 2018. [Accessed 20 April 2019]; Available from: https://www.ukessays.com/essays/religion/symbolism-water-religion-4873.php?vref=1.